Why did you start travelling to Jordan? Well, our Jordan years began back in 1984 when, inspired by the Lawrence of Arabia film, Di Taylor and I and a couple of close climbing friends asked Jordan’s Tourism Ministry for permission to explore the climbing potential of Wadi Rum. That led to a lifelong friendship with the Zalabia Bedouin of Wadi Rum who still had a semi-nomadic life, almost all living in their famous ‘black-tents’ in the desert. They invited us to their camps, showed us the whole area, named the mountains, canyons and deserts for us, and told us about their own climbs made on hunting trips into the mountains. Some of these climbs are now known as “amongst the world’s best mountain adventures”. We go back to Rum every year to spend time with our friends many of whom are now guides; some were not born when we first visited, so we have known them since birth! The result of these early trips was our 1987 guide to Treks & Climbs in Wadi Rum now in its revised 5th edition. By the late ’80s we had formed n.o.m.a.d.s. (New Opportunities for Mountaineering, Adventure & Desert Sports) and were exploring further afield in and beyond Petra and Dana, and had done a 3 day trip down the Mujib Canyon from the King’s Highway to the Dead Sea without a map and before the Dead Sea Highway was built, so we expected to have to walk out. Instead we were arrested as suspected Israeli spies on arrival at the Dead Sea shore! Further explorations, largely assisted by H M Queen Noor, led to the publication of Jordan – Walks, Treks, Caves, Climbs & Canyons in 1999. We were just finishing work on a 2nd edition when Daniel Adamson of the Abraham Path Initiative (API) asked us to help in Al Ayoun, so our explorations in Jordan have now spanned almost 30 years and there is still more to do with other new adventure projects already simmering! 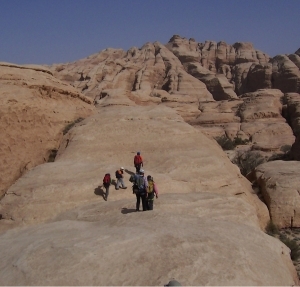 Tell us about your new guidebook, “Walks, Treks, Climbs, & Caves in Al Ayoun, Jordan”. 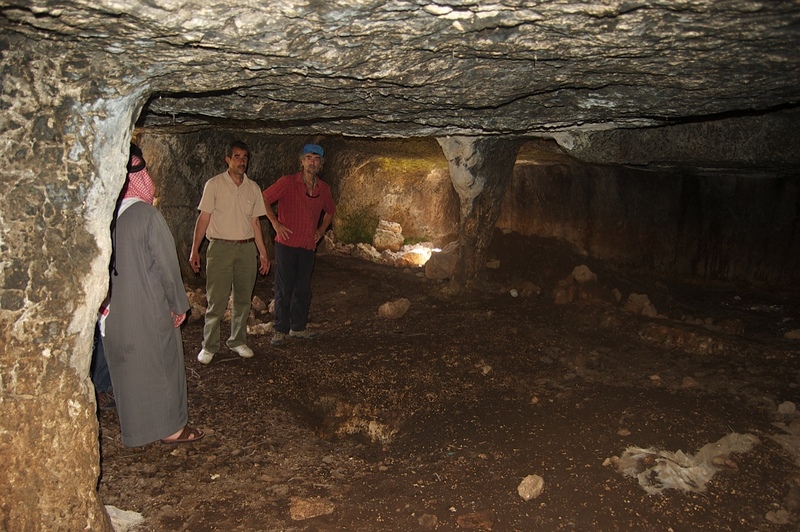 The Al Ayoun Project was a bit of a surprise for us, not only getting a request from the API to help develop the area, but also because we had somehow missed Al Ayoun in our exploration of Jordan for our Jordan trekking book! And what a wonderful place it is, as well as being home to the welcoming people of Al Ayoun. Within a couple of weeks we realized the region had the potential for it’s own walking guidebook. We even found a new cave (Jordan’s first pothole) and numerous new cliffs for climbing. We we were hosted there by API and the Al Ayoun Community and in return were very happy to produce the guide to ‘Al Ayoun, Walks, Treks, Climbs & Caves’ to promote the area and its home stays and services. When funds were needed for publication, Jane Taylor stepped into the breach and found Fadi Ghandour who generously sponsored the publication by Vertebrate Publishing, UK, and printing by Jordan’s National Press. It’s now on sale in Amman’s best bookshops and in Al Ayoun, and is distributed in the UK by Cordee. It seems like you have been busy in Jordan. Have you been active anywhere else? We had four trips to India, one to Ladakh and Rajasthan, one to the the Western Ghats and the south, and two visits opening new treks in Nagaland on India’s Burma (Myanmar) border in what was then a closed area. As n.o.m.a.d.s. we were also involved with adventure tourism development in Madagascar, Libya, Oman, Palestine and Egypt (where we ended up in a military jail having been, unknown to us, climbing desert mountains in a closed military area on the Sudan border). Other trips in that period include Ethiopia, Sudan, Morocco and Mali (for Timbuktu’s Desert Festival) as well as Norway, the Alps and Dolomites, the Picos D’Europa, the Balkans and the Nepalese Himalayas. How has Jordan changed since you started visiting? Simple answer – massively! For example, in 1984 Rum was a Bedouin tent camp with a fort, and half a dozen houses at the end of a rough single track road. There was neither water nor electricity, nor indeed was there any tourism worth mentioning. The Bedouin were shepherds, poor in wealth, but rich in life. These days, Rum is a World Heritage Site and Protected Area with a large village. 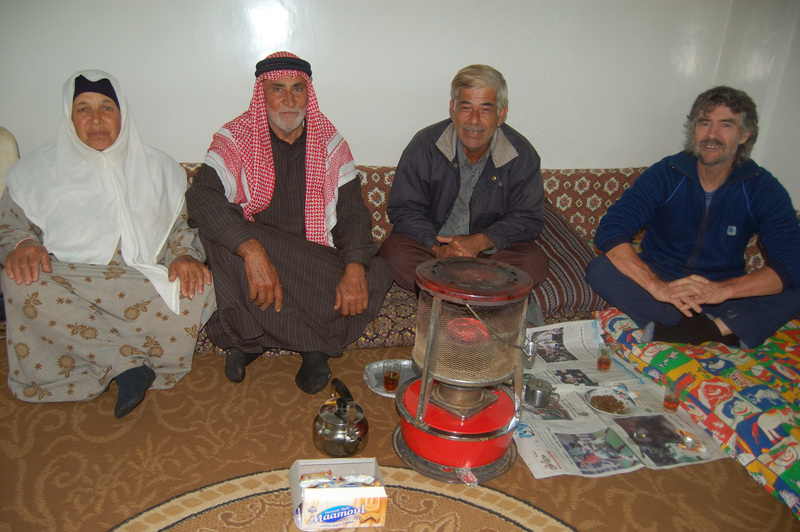 The majority of the Bedouin make a good living from tourism though some of the elders have the feeling that life was better before. The Bdul Bedouin still lived in Petra in 1984, making it somehow all the more attractive, and there were only two hotels in Wadi Musa! The Desert Highway was a virtual death trap in desperate need of repair with lumbering trucks, often driving on the wrong side of the road and without lights at night! Aqaba was a village compared with today’s tourist hot spot and Amman was perhaps a quarter of today’s spreading concrete city. Jordan’s Royal Society for the Conservation of Nature, the RSCN had yet to open a Reserve – they seemed to follow in our footsteps! 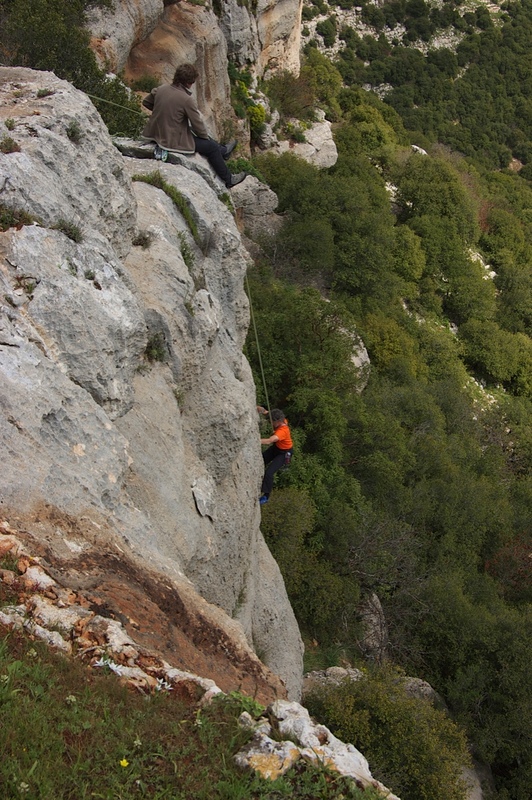 They are now responsible for the care of much of Jordan’s most beautiful and endangered environments. The two constants are the always hospitable people and – once you escape the ever increasing towns and villages – the amazing variety of scenery from Red Sea and Dead Sea to deserts, mountains, canyons and the green hills and valleys of the north, with fascinating antiquity sites wherever you go – and more still being discovered. What has been your favorite experience in Jordan? Simply being met by strangers and invited into their homes, whether it be a Bedouin tent or a city house, no excuses accepted. Tell us about an experience with local Jordanians that surprised you. Our discovery in 1984 that the Zalabia Bedouin of Wadi Rum not only knew their mountains intimately but climbed there, often alone, moving incredibly fast on hunting routes most of which are extremely long and complex and sometimes require grade 5 climbing (classed as Very Severe in the UK grading system) or even harder, often where an accident would be fatal – skills that many of today’s climbers would find hard to emulate. If you could spend a week in one place in Jordan, where would it be and why? It would have to be with our friends, and split between majestic Wadi Rum (and I mean the real Wadi Rum where our Bedouin friends live in the valley and village of that name, between the mountains of Jebel Rum and Jebel um Ishrin), and Al Ayoun in the north with its verdant hills. The hospitality in both these areas epitomises all that is good about Jordanian people. And here I would have to apologise to other friends in Wadi Musa and Amman! Apart from climbing and trekking guidebooks written or contributed to in England, Norway, Oman, Jordan, Palestine and Egypt, Tony’s publications include ‘Troll Wall‘ about a major first ascent of Europe’s highest north face that he was on back in 1965, and a tale of ‘Adventures in the Northlands‘ about escapades on the mountains, seas and rivers of Canada’s Yukon and North West Territories, Greenland, Iceland, and Norway. Above photos are copyrighted and used with permission of Di Taylor, n.o.m.a.d.s. Interested in travelling to Wadi Rum or Al Ayoun? Get in touch with Jordan and the amazing people who call it home. Fill out our Build Your Tour form and let us know how to make your trip remarkable. Did you enjoy reading this? Help us tell others of adventures to be had in Jordan by clicking here to tweet this post (you can preview your tweet before you send it).